Formed in the sixties, the Falling Stones, not to be mistaken with the Rolling Tones (we’re not kidding, a band of that name actually existed in the Antilles! ), are probably Surinam’s most popular and longest lasting beat-soul group. They played in different combinations and are still active (see their website here). We chose for this 45 on the Suriname label (No. 1001). This B-side has a snail-paced Hammond and the atmosphere of a folk record. The other side “Now you want to leave me alone” is equally good, midtempo and with a horn section that blows away everything that comes in their path. 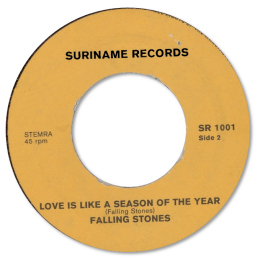 The Falling Stones have one album on Suriname that is well worth seeking out, but does not contain the two sides of this 45. Actually not a rare 45. Louis Windzak sang with the Falling Stones. Louis is still active around Rotterdam and Amsterdam. 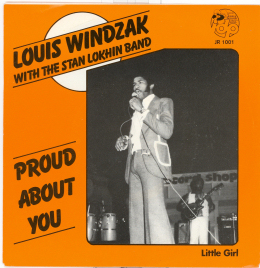 Louis Windzak is known as the Dutch Otis Redding and indeed there is a striking resemblance. Stan Lokhin directs the band. Anything produced by Lokhin is worth checking out. He worked with Billy Jones and Oscar Harris and many other Surinam artists. Lokhin’s credentials as trumpet player or bandleader are listed at the surinamstars.com website. At the moment he is a director of gospel choirs in Amsterdam.